WordPress plugin Wow Viral Signups Pro: more Registered Users. 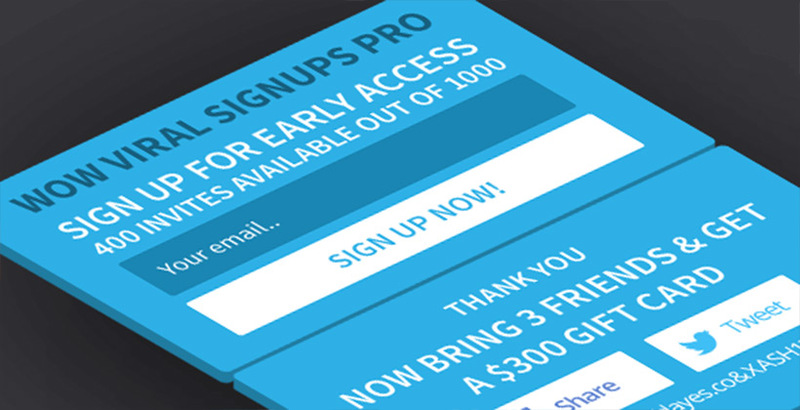 Run the “viral” subscription on your site with WordPress plugin Wow Viral Signups Pro. Use the included plugin tools for solving a wide range of marketing tasks, which are built on creating outward appearance of deficit for the potential user of your site. Regular registration. The form is used to collect users’ email-addresses. Registration with the offer to receive bonuses for the invitation of referrals. Registration with limited availability. It is used to organize events, create the effect of ownership or elitism. Limited availability registration with the referral system. Use the plugin’s possibilities for WordPress with registering by the referral link to create a situation in which the potential users will be keenly interested in registering and mobilizing friends using the referral program. The registration form is inserted anywhere on your site using the short code generated by the plugin. Use the plugin to create an unlimited number of forms. Select the most effective approach to attract new users. Registration takes place without a page refresh. export the subscribers base in the formats * .csv and * .xlsx. Set Wow Viral Signups Pro and configure it by following the step-by-step instructions in Readme. Create a unique text, focused on the target audience, including one that will be shown on Facebook. Place in the form “share” buttons for Twitter and Facebook. Fraud protection is integrated in the plugin (Session Tracking), which prevents users to enter different email addresses. For greater efficiency, use Viral Signups with other products, created by our team. When someone signs up using a referral coI want to send someone an email telling them that they had a successful referral.